E and I both agree that you won’t like these. Not one bit. Nope. Nuh uh. 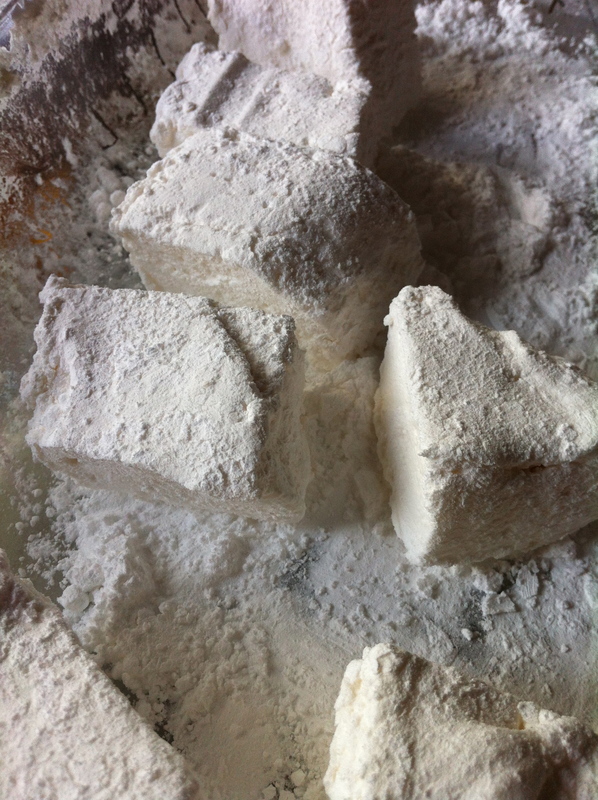 This morning, while the babies took their nap, E and I decided to make marshmallows. We thought they’d be excellent either as an afternoon snack or perhaps as dessert after dinner with Grandma & Poppa. E read through the recipe, we gathered the ingredients together, and started the process. I helped E measure out the sugar, the gelatin, the corn syrup, and everything else. She stirred it all together and when it was time I shifted everything to the stand mixer. 10-15 minutes later we poured the mix into a prepared dish and whacked the thing into the fridge for 3 hours. And those were from C.
3 1/2 envelopes unflavored Gelatin (2 Tablespoons plus 2 1/2 teaspoons) **I ordered fish-based Gelatin from Modern Pantry. That site ROCKS!! We used this instead of Knox because Knox isn’t Kosher. 1- Oil bottom & sides of a 13x9x2 baking dish (*I used a glass casserole dish) and dust with confectioners’ sugar. 2- In bowl of a standing electric mixer add 1/2 cup cold water and sprinkle gelatin over it. Let it stand to soften. 3- In a 3-quart heavy saucepan cook granulated sugar, corn syrup, second 1/2 cup of cold water, and salt over low heat, stirring with a wooden spoon, until sugar is dissolved. 4- Increase heat to moderate and boil mixture – WITHOUT STIRRING – until thermometer registers 240ºF, about 12 minutes. 5- Remove pan from heat and pour sugar mixture over gelatin mixture, stirring until gelatin is dissolved. 6- With stand mixer (or hand-held electric mixer) beat on high speed until white, thick and nearly tripled in volume, about 6-10 minutes, maybe a little longer if using hand-held. 7- In a separate bowl, with cleaned and dried beaters, beat egg whites until they just hold stiff peaks. 8- Beat whites and vanilla into the sugar mixture until just combined. 9- Pour mixture into prepared baking pan – and DON’T FRET if you don’t get it all out. It’s pretty sticky. 10- Sift 1/4 cup confectioners’ sugar evenly over the top **I just sprinkled the sugar over. Didn’t feel like digging out my sifter. 11- Chill marshmallows, uncovered, until firm – at least 3 hours, and up to one day. 12- Run a thin knife around the edge of the pan and invert onto a large cutting board. Lifting up one corner of the upside-down pan, use your fingers to loosen the marshmallows and ease them onto the cutting board. 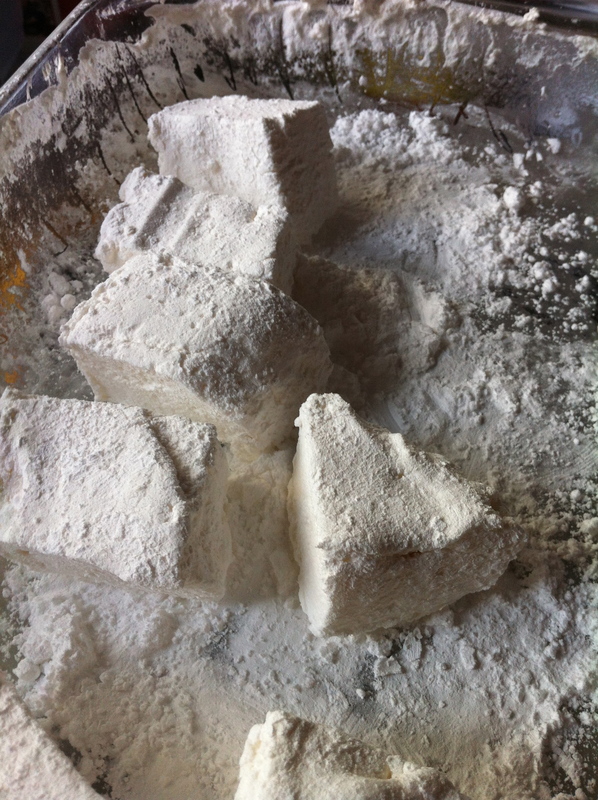 With a large knife (or oiled pizza cutter) trim the edges and then cut marshmallows into roughly one-inch cubes. 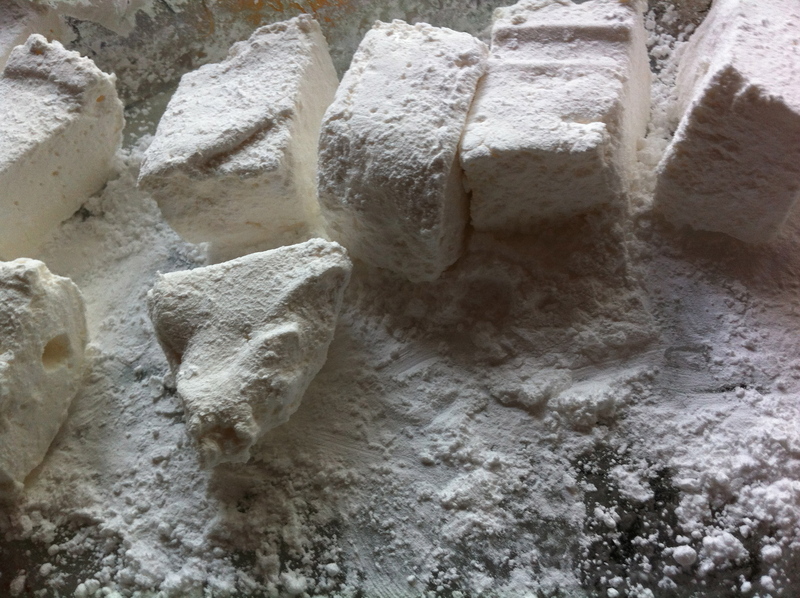 Sift the remaining confectioners’ sugar back into your now-empty baking pan, and roll the marshmallows through it, on all six sides, before shaking off the excess and packing them away. Can be kept in an airtight container at cool room temperature for one week. BTW – We ended up eating them as an aperitif. After dinner, C went to make sure I had enough gelatin to make a second batch.